Recently, Win Butler confirmed that the upcoming Montreal show at Parc Jean-Drapeau will be the last of Arcade Fire's costume-themed Reflektor tour. As the band quickly approach the end of their current tour, they’ve been teasing their fans with sample covers from a variety of bands and even a movie theme song. For the most part, their covers have coincided with a local artist from the city they performed in, but that's not always the case as you'll see below. Guess which city Arcade Fire performed the song London by the London Band, The Smiths? In Santa Barbara, Arcade Fire covers punk band Dead Kennedys' California Über Alles. Coincidentally, this song was written in 1979 about then mayor Jerry Brown.. who also happens to be their current mayor. The only movie soundtrack cover came in the form of the theme of Beverly Hills Cops which Win described as "F Axel" a song about Axl Rose. This one was done in Los Angeles. Toronto is Canada's largest city but over the past couple of year's, their reputation has been tainted with their infamous mayor, Rob Ford. Arcade Fire poked fun of the mayor while performing Young Lions by Constantines. Out of all the covers, Motownphilly by Boys II Men must be the least expected. Obviously, this one was done in Philly. Not even Stevie Wonder is exempted from being covered by the Montreal-based band. Here's the Motown classic, Uptight (Everything's Alright). Not only did they perform Prince's Controversy in Minneapolis, check out this cool headgear that they wore. Looks just like the artist. 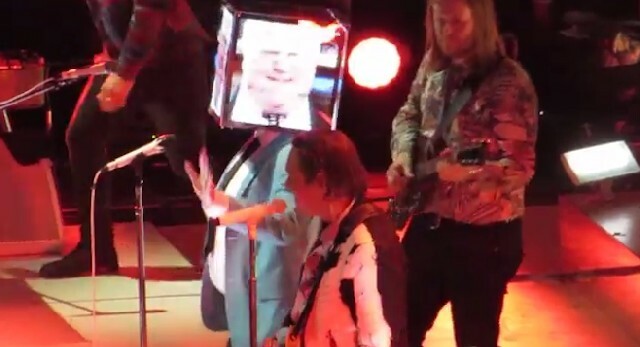 Arcade Fire channeled their inner Michael Stipe in Atlanta on May 2nd by performing REM's Radio Free Europe. Arcade Fire covered Win Butler's biggest inspiration, Nirvana, with this mashup of Smells Like Teen Spirit and Rococo in George Washington on August 8th. Arcade Fire mashed Been Caught Stealing by Jane's Addiction with Here Comes The Night Time at Le Forum in Los Angeles on August 1st. Bonus, they also threw in a bit of G'N'R with Welcome To The Jungle.